Pacific Bungee has closed — unsure why — and Tropical Bungee encountered governmental red tape over using the Naranjo Bridge. For more Bungee Jumping Videos in Costa Rica, check out what YouTube suggests at the end of this video! Feeling a little crazy? How about daring? Combine the two and you’ve got bungee jumping! Don’t ‘Walk like an Egyptian’, when you could ‘Bounce Around like a Piñata’ instead! Costa Rica offers you safe, yet unique, jumping options as an exciting part of your tropical trip! Bungee jumping is not for the faint-hearted. To throw yourself from a great height, saved from certain death by only an elasticized rope takes courage or lunacy or both! Fortunately, if you do fall into one of these categories, you will find Costa Rica is the perfect location to propel yourself into the air (and back again)! 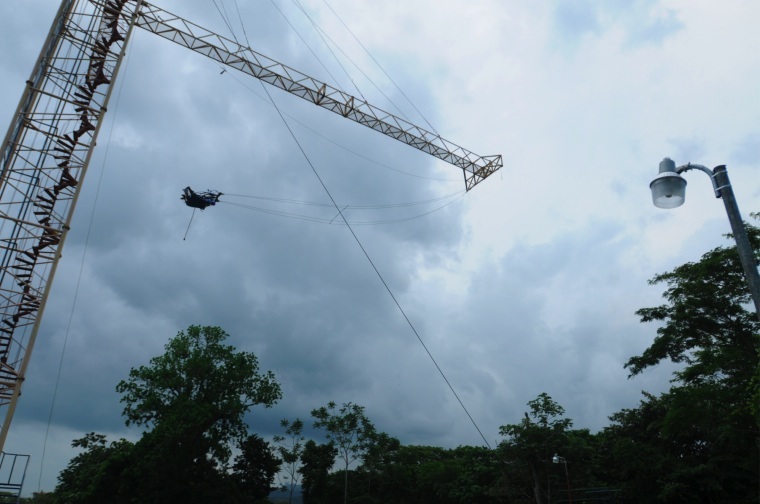 Costa Rica’s pleasant temperatures and breath-taking scenery make bungee jumping here far more enjoyable than the traditional opportunity to jump from a crane in a parking lot in say the US, Canada or Europe. A huge additional bonus is the cost — you can bungee jump here cheaper and without any compromise to your safety. Why pay a small fortune at home for an adventure of a lifetime when you can pay less to have it in the sun? Well, for the time being, we’re down to just one place to get your "ups and downs". If our readers know of another spot, please leave us a comment below and we’ll add it to this post. The same tips apply, but we’ll just have to do it somewhere else other than Jaco and the Old Rio Colorado Bridge in Naranjo. Secure Shoes: Preferably those that tie or velcro on. No flip-flops please. Clean Bill of Health: Potential jumpers should not participate if they have a heart condition or existing back and/or neck problems. If you have a medical condition, please check with your doctor before jumping. Revealing Clothes: Skirts, dresses or any other clothing items that may reveal more than you may wish to — especially if you’re wet and/or flinging through the air. Lycra/Spandex does wonders, but not at 60mph! Chewing Gum: A potential choking hazard for jumpers! Heavy Meals: Breakfast might be the most important meal of the day, but not if you’re going bungee jumping! Think of the old rule — wait an hour before swimming. I’d wait more like an hour and a half, but it’s your stomach — and clothes! Here’s some bungee pictures from Pacific Bungee when they were in Jaco. For your own safety and enjoyment, we strongly advise booking tours with reputable and experienced companies with proven safety records and well-maintained equipment. For starters, see reviews on independent websites such as Trip Advisor. 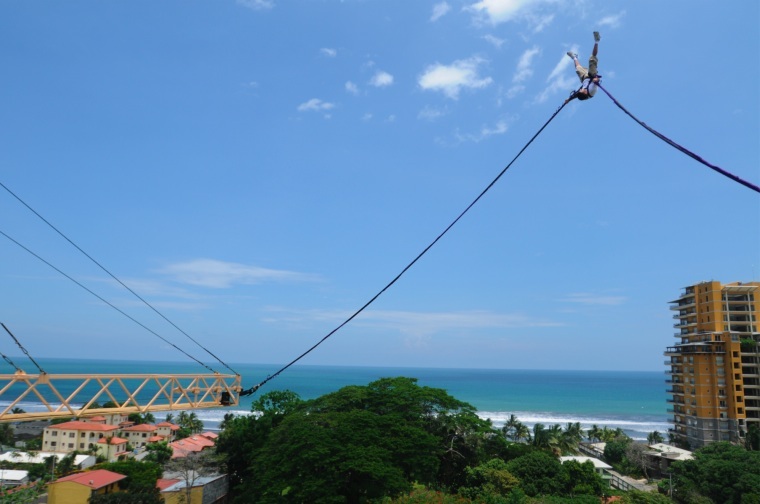 Since bungee jumping was first introduced into Costa Rica in the early 1990s, there have been no serious injuries or deaths reported in the sport. So if screaming adventure and heart-pounding fear are essential elements to your vacation, then look no further! 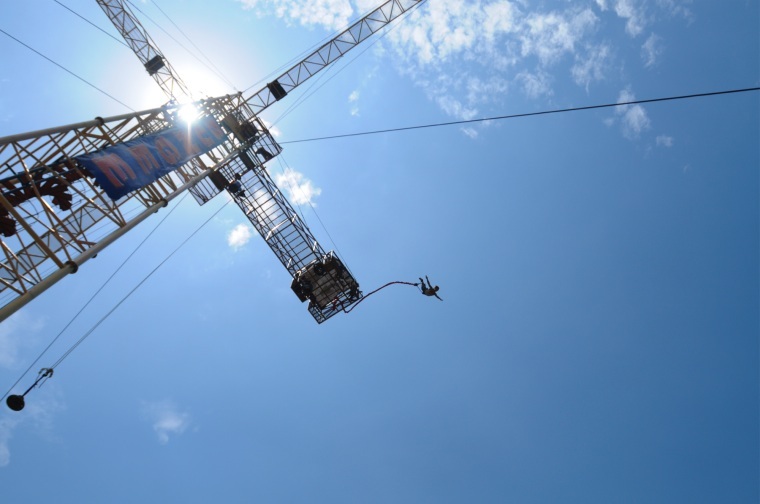 Bungee jumping is your answer. Costa Rica can offer you safe, yet unique, jumping options as an exciting part of your tropical trip! Nice article and very helpful for those who wish to bungee jump. It’s a shame that two places of business have closed their doors, but it’s also great to see a new venue/twist — cable car tram over a cloud forest — to help attract thrill-seekers to visit Costa Rica. Awesome moment…to breath and then jump. If I lived where this is, my life would be happier.